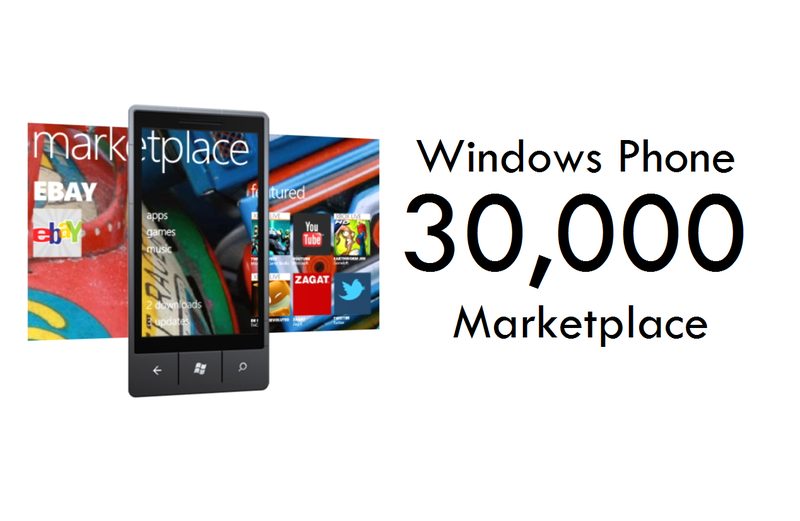 TechCrunch reported yesterday that the Windows Phone market place has reached the 30,000 App milestone. WMPU and TechCrunch later pointed out though that they may be slightly off that mark, but not that far. That’s 20,000 apps shy of Ovi Store, however, this is 30k apps that is just Windows Phone, whilst Ovi Store has S60 5th, Symbian^3 and S40 (Maemo/MeeGo numbers possibly negligible). Note that whilst Qt does make it easer to port apps from MeeGo to Symbian, they aren’t necessarily immediately compatible and are counted as different apps. I have no idea what webOS or BlackBerry has in their stores, but Apple Store and Android Market have 450,000 and 250,000 respectively. 30,000 in about 10 months? That’s pretty good, no? Especially as there’s so few in the way of users. It’s good to see it getting developer attention. Is it all about Apps? Are numbers important? Some folks argue against that it’s not. e.g. Like David Heinemeier Hansson who says you just need some core things done really well. However, apps are also gaining importance/awareness with buyers. They may not be looking use those apps all the time but they are looking to have something fresh to try every now and again. One such proponent of App importance is Robert Scoble, who time and time again says that this is a determining factor in OS success. Do devs like the platform? Do they like making apps for it? Is there a market? Apple’s App Store may never be caught, but you might not need to. You just need to reach a threshold of enough apps, as Android has. A concern with getting so much in numbers is the noise, or crappy apps. We may joke about the fart apps that are bountiful in App Store, and there are plenty of ugly, crappy, awful rehashes done over and over, but then there are also some stunning applications there created by some brilliant developers that make that platform look even more attractive (like Jan Ole Sur has with Gravity and Symbian). Ovi Store has some fantastic gems, but unfortunately, there’s too much in the way of crappy apps – very unpolished, basic, clunky looking apps. It is fortunately getting much better with the newer apps following the Qt UI guidelines. Have you seen how nice 4squick looks? What about fMobi (less on Qt UI guidelines but looking great). Ovi Store apps will go even further with the Belle update and possibly better hardware on newer S^3 (hopefully this will not introduce fragmentation due to different hw requirements). Ovi Store is doing amazingly in term of downloads (9M/day at last count, just half of Android), helped by the summer gift of games, no sign in for free apps, new influx of Qt apps and of course the growth of S40 apps. Imagine how much better these numbers would be with more/higher proportion quality apps? This is just an observation, and not a fanboy remark (as any positive winpho news is perceived by some to be) but Windows Phone apps do look good I’ve got 165 apps now of some good/great quality apps on app store. I think I might just wait for a Nokia Windows Phone to demo you guys the apps I like on this platform, keeping it for MeeGo/Symbian/S40 apps for now here. There is a concern that such a quick increase in apps from Market Place that it will also be bogged down with crappy apps (e.g. bad quality apps, repeat apps, simple bookmarks as an app, a whole ebook or comic as one app, different versions of the same apps counting as individual apps). Apparently there are procedures to stop developer spammage. Plus folks like Brandon Watson are always on the search for more developers (there’s news of 1000 responses from webOS devs now looking to join the Windows Phone initiative, not to mention their project to get any regular developer focusing on Windows Phone). Another concern on app front is fragmentation, rife on Android and not so much documented on Symbian due to different OS versions and different screen resolutions. Though Qt is meant to be that unifier, even something as simple as the E6’s change in resolution makes compatibility difficult. News is that devs are working on updating/making apps for Mango (taking advantage of the new sets of features available) and there are concerns there that this will begin the fragmentation for Windows Phone. I think this is possibly more similar to iOS? As long as you have the latest OS you should be able to tap into all apps, unless of course there’s something hardware specific (e.g. front facing camera app?). Looking at the upside, as I often try to as a Nokia fan, there’s quite some things to look forward too if you want apps, but just don’t want Android or iOS. Apps is just one facet of a smartphone, and it looks to be covered and growing well on this front. No need to fear than by going to a new platform, there won’t be any apps.